Ear infections are conditions in which bacteria or viruses invade the ear. When Bobby's little brother was still a baby, he started having one ear infection after another. At first, he was too young to tell anyone when his ear hurt, but he would tug at the ear and cry. Later, Bobby noticed that his brother always sat close to the television and sometimes did not seem to hear when other people spoke to him. The doctor said that Bobby's brother had fluid in the middle part of his ears that was interfering with his hearing. When the fluid did not go away within a few months, the doctor said that the boy needed to have tiny tubes put in his ears. It was a quick operation that the doctor was able to do without Bobby's brother needing to stay overnight in the hospital. With the fluid drained out of his ears, Bobby's brother was able to hear better. Ear infections are conditions in which bacteria * or viruses * invade the ear and cause problems. The human ear is divided into three main parts: the outer ear, the middle ear, and the inner ear. When people talk about an ear infection, they usually mean an infection of the middle ear, a disorder known as otitis media (o-TY-tis MEE-dee-a). Next to the common cold, this is the most frequent of all childhood illnesses. Most children have had otitis media at least once by the time they are 3 years old. It usually causes no lasting problems. However, if otitis media is not treated or if it occurs often, it can lead to hearing loss. In fact, otitis media is the most common cause of hearing loss in children. * bacteria (bak-TEER-ee-a) are single-celled microorganisms, which typically reproduce by cell division. Some, but not all, types of bacteria can cause disease in humans. * viruses are tiny infectious agents that lack an independent metabolism (me-TAB-o-liz-um) and can only reproduce within the cells they infect. eardrum, a paper-thin membrane * that separates the outer ear and the middle ear. The middle ear is a pea-sized space containing three tiny, delicate bones. When sound waves hit the eardrum, it starts to vibrate, or move back and forth. These vibrations pass through the bones in the middle ear. They then are delivered to the inner ear, which changes them into nerve signals to be sent to the brain. The middle ear is connected to the back of the nose by a narrow tube, known as the eustachian (u-STAY-kee-an) tube. This tube prevents too much pressure from building up inside the ear by letting air move into and out of the middle ear. Keeping a steady pressure inside the ear is important, so that the eardrum can work properly and does not get damaged. When a person yawns and hears a "pop," this is really the eustachian tube opening to make sure the air pressure is equal on both sides of the eardrum. An ear infection often starts with a cold, another nose or throat infection, or an allergy * problem. The affected part of the body reacts by swelling and making fluid. Due to this swelling, the narrow eustachian tube can become blocked, trapping fluid in the middle ear. Bacteria or viruses can become trapped as well, thriving in the fluid. The buildup of fluid in the middle ear can cause earache and other symptoms. Since pressure from the fluid keeps the eardrum from moving back and forth properly, the buildup also can cause hearing loss. This is known as acute * otitis media. * membrane (MEM-brain) is a thin layer of tissue that covers a surface, lines a cavity, or divides a space or organ. * allergy (AL-uhr-jee) is a condition in which the body's immune system is overly sensitive to a particular substance. In some cases, the eardrum bursts, and pus drains out of the ear. In other cases, fluid remains in the middle ear, even after the infection has cleared up. Acute otitis media then turns into an ear problem known as otitis media with effusion * . The fluid buildup can last for weeks or months. This can lead to longer term hearing problems. It also may make the person more prone to new infections. People of all ages get ear infections. However, such infections are especially common in young children. This is because the eustachian tubes of children under age five are very small and soft, and so they are easily blocked. Another reason that young children get ear infections is because of their adenoids (AD-e-noidz). The adenoids are lymph glands * in the top of the throat that help the body fight infections. Usually, the adenoids shrink as children grow older, until they have almost disappeared by puberty * . When the adenoids are infected, they sometimes swell until they block the eustachian tube. Why Do Ear Infections Matter? Most ear infections clear up without causing any lasting problems. However, they can be quite painful for a few days. In addition, they can lead to longer term hearing loss. In young children who are just learning to speak and understand language, even a mild hearing loss may make it harder to master these tasks. Another risk of ear infections is that they can spread to nearby structures in the head. In particular, an infection may spread to the mastoid (MAS-toid) process, the bone behind the ear. In rare cases, it can destroy this bone and attack other parts of the body. * lymph glands are masses of tissue that contain immune cells that filter out harmful microorganisms (my-kro-OR-gan-iz-um); they can become enlarged during infection. * puberty (PU-ber-te) is the period during which sexual maturity is attained. Another common ear infection is external otitis, better known as "swimmer's ear." 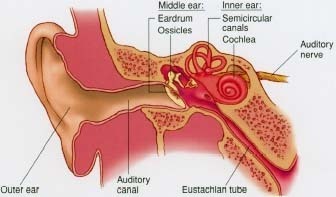 This is an infection of the ear canal, the passage that carries sound from the outside part of the ear to the eardrum. It is caused by bacteria or fungi. When water gets into the ear, it can bring such germs with it. Usually the water runs out, the ear dries inside, and the germs do no harm. If the water stays for too long in the ear canal, though, the skin can get soggy, and the germs can grow and cause problems. People usually get this kind of infection by swimming or diving for long periods in a dirty lake, river, or pond. However, even swimming in a pool can lead to infection, because pool water dries out the skin of the ear, making it easier for germs to invade. People who do not swim also can get this kind of infection by scratching the skin of the ear canal while trying to clean their ears with a sharp object, such as a hairpin. The main symptom of external otitis is severe ear pain that gets worse when the outside part of the ear is touched or the head is moved. Other possible symptoms include itching, drainage of pus from the ear, hearing loss, and a mild fever. For treatment, doctors may clean the ear canal with a special probe or a suction device. Doctors also may prescribe medications to fight the infection and to relieve the itching and swelling. Doctors can view the inside of the ear with an otoscope (0-to-skope), a special tool, similar to a flashlight, with a light and a magnifying lens. Using this tool, doctors can look for redness in the ear and fluid behind the eardrum. Some otoscopes have a bulb attached that doctors can use to blow a puff of air onto the eardrum. This lets doctors see how well the eardrum moves. Other tests may be needed in some cases. Tympanometry (TIM-pa-NOM-e-tree) is a test in which a soft plug is placed in the ear. This plug is connected to a machine that makes a low sound and records how the eardrum reacts. The test is designed to find out if the eardrum is moving back and forth as it should. Audiometry (AW-dee-OM-e-tree) is a hearing test in which people listen to various sounds of different pitches. It is designed to find out if an ear problem has caused hearing loss. Antibiotics * often are used to treat ear infections. Such drugs usually make the earache go away quickly, but the infection may take longer to clear up. Therefore, it is important that all the antibiotic be taken just as the doctor prescribes. Many ear infections are caused by viruses, which are not killed by antibiotics. These infections are handled by the body's immune system. In addition, doctors may suggest a medicine to reduce the fever and pain. A warm heating pad or water bottle placed on the painful ear may help it feel better, too. How Is Fluid in the Ear Treated? Sometimes, fluid remains in the middle ear even after the infection is gone. For most children, this fluid goes away without treatment in 3 months or less. If the fluid persists, doctors may recommend additional courses of antibiotics. However, long-term antibiotic treatment can have unwanted effects, such as side effects of the drug, inconvenience, and cost. It may also play a role in the development of new strains of bacteria that are resistant to the drug. This means that the bacteria no longer are killed by it and so are harder to treat. If fluid stays in the middle ear for longer than 3 months, and if it is causing a hearing loss, doctors may suggest an operation to insert tiny tubes through the eardrums. In this operation, a small slit is made in the eardrum, and the fluid in the middle ear is drained out. Then a tube is placed in the slit, letting air get into the middle ear and reducing the risk of future ear infections. Most such tubes come out of the eardrum on their own in a matter of months. * antibiotics (AN-tih-bi-OT-iks) are drugs that kill bacteria. The labyrinth (LAB-uh-rinth) is another name for the inner ear, which plays a key role in hearing and balance. An infection caused by bacteria or viruses in this part of the ear is known as labyrinthitis (LAB-uh-rin-THI-tis). Symptoms include extreme loss of balance, dizziness, nausea, and vomiting. The eyes also may move slowly to one side, then flick back to the center. While these symptoms can be scary, they usually do not pose a serious threat if the person gets treatment. Doctors may prescribe drugs to combat dizziness and nausea as well as antibiotics to fight bacteria. The person also may need to rest in bed for several days. The most severe symptoms usually pass within a week, although problems with balance can last for weeks or even months. Studies have shown that young children who live with smokers have more ear infections than other youngsters, and so it is smart to keep children away from cigarette smoke. Also, young children who spend time in group day care get more ear infections, probably because they are exposed to more colds and respiratory illnesses, and so it is a good idea to keep children away from playmates who are sick. In addition, babies who are bottle-fed, especially while they are lying down, get more ear infections than breast-fed babies, and so it is usually best if mothers breast-feed. If the baby is bottle-fed, it helps to hold the baby's head above his or her stomach level during feeding. American Academy of Otolaryngology—Head and Neck Surgery, 1 Prince Street, Alexandria, VA 22314-3357. This group for doctors who specialize in treating ear, nose, and throat disorders has information about ear infections on its website.